On April 26, Classroom Law Project honored Justice Hans Linde as the 2017 Jonathan U. Newman Legal Citizen. Justice Linde is a retired Oregon Supreme Court Justice and long-time legal educator and scholar. He is renowned as one of the foremost thinkers in constitutional law, particularly as it applies to state constitutions and the protection of individual rights. 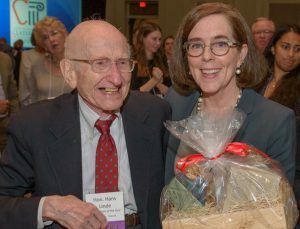 Nearly 400 people gathered at the Sentinel hotel in Portland to recognize his lifetime of accomplishments, just a few days after his 93rd birthday! Oregon Governor Kate Brown was on hand to offer her thanks and congratulations to Justice Linde, joining a number of current and retired state judges who shared their memories of his influence on the law and on their lives. 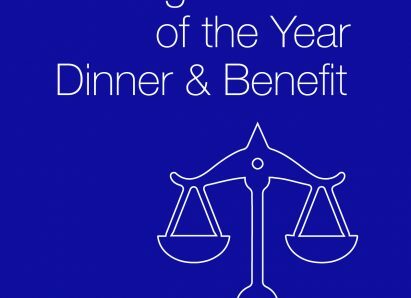 For more information on the Legal Citizen honor and past honorees, visit the Classroom Law Project website. Photographer Andie Petkus has also posted more photos from the evening here.